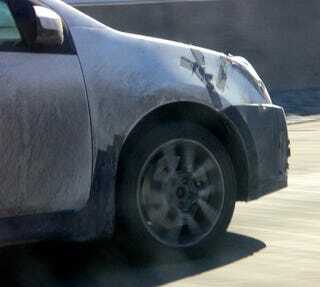 Spy Photos: 2008 Nissan Sentra SE-R? "I saw this on I-75 heading south just past I-275. I just happened to have my camera with me. When the driver saw that I was taking pictures he wouldn't get in front of me. He stayed back about 10 car lengths." Well, at the very least it would seem Nissan's now putting that shiny new Farmington Hills, MI Tech Center to good use with some cold weather testing of mules.